Perfect for a dyed-in-the-wool hockey fan! 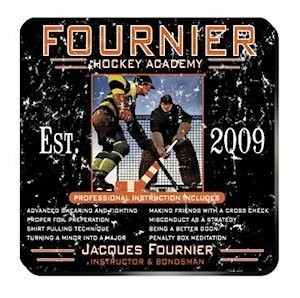 Each set of four coasters includes an old-fashioned hockey image, cork backing and a mahogany caddy. Full-color design lists funny instructional tactics such as: shirt pulling, turning a minor into a major and penalty box meditation. You indicate the first and last name of the appointed "instructor and bondsman" plus the establishment year during checkout.